NAFTA has had negative and often unintended consequences for many people in North America, including farmers, workers and consumers. An example of some of these consequences can be seen in the infographic on the previous page. Right now, there is a similar trade agreement being negotiated by twelve countries, including the U.S., Mexico and Canada, called the Trans-Pacific Partnership (TPP). The TPP threatens to have effects similar to NAFTA, but on a larger scale, threatening human rights, the environment and jobs. 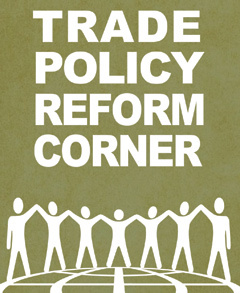 Late in 2012, a group of labor leaders, trade justice advocates, family farmers, environmentalists, food sovereignty groups and others from the U.S., Canada and Mexico created a “North American Unity Statement Opposing NAFTA Expansion through the Trans-Pacific Partnership (TPP),” with the goal of uniting 1,000 organizations in opposition to the TPP.